Crisis Action coordinates a global network of leading human rights, humanitarian and foreign policy organisations, harnessing their expertise to ensure world leaders uphold their obligations to protect civilians. Under Gemma’s leadership, Crisis Action received the 2012 MacArthur Award for Creative and Effective Institutions and the 2013 Skoll Award for Social Entrepreneurship. In 2011, the World Economic Forum selected Gemma as one of their Young Global Leaders. She previously worked for the Permanent Mission of the United Kingdom to the United Nations in New York, the European Commission and as a journalist in print, radio and TV. 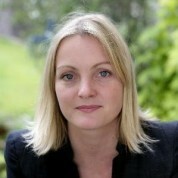 Gemma is incoming Chair of the Helen Bamber Foundation and sits on the board of 38 Degrees. She holds a first class degree in Politics, Philosophy and Economics from Oxford University and European Master’s degree in Human Rights and Democratisation. "I would not be where I am today if it had not been for some incredible teachers who inspired, motivated and believed in me. They were the first people, outside of my family, who showed me how to shatter the glass ceiling of my own expectations and discover a fascinating world beyond. To be a great teacher is to give someone the key to a fulfilled, happy and useful life. The Teacher Prize celebrates teachers who are transforming our children’s lives and therefore our future. They belong on a level with the most celebrated people of our times."